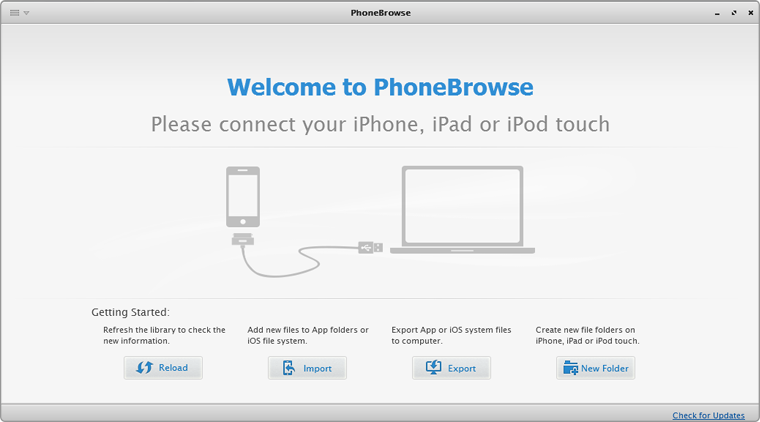 PhoneBrowse is free iPhone Explorer software, which is made to access, explore and manage your iPhone, iPad and iPod touch file system without jailbreaking. NEED ULTRA CARE ON IDEVICES? PhoneBrowse quickly creates a connection between iOS device and PC to allow for an easy transfer. This iPhone Explorer offers top-notch functionality and design. Easily browse through your iPhone content to import and export files, as well as managing applications using this powerful tool. Free Browse iPhone File System and Use iPhone as Flash Drive. It can help you to freely add, delete or rename all types of file saved on your iOS devices. PhoneBrowse is a free iPhone explorer software, it can make iPhone work in Disk Mode and manage iPhone files system without jailbreaking. 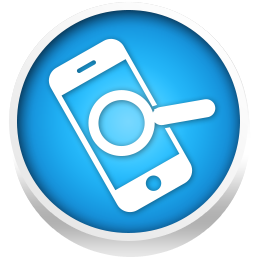 PhoneBrowse is completely free iPhone explorer for users who get confused when they try to find files from iPhone, iPad, and all iOS devices indeed. 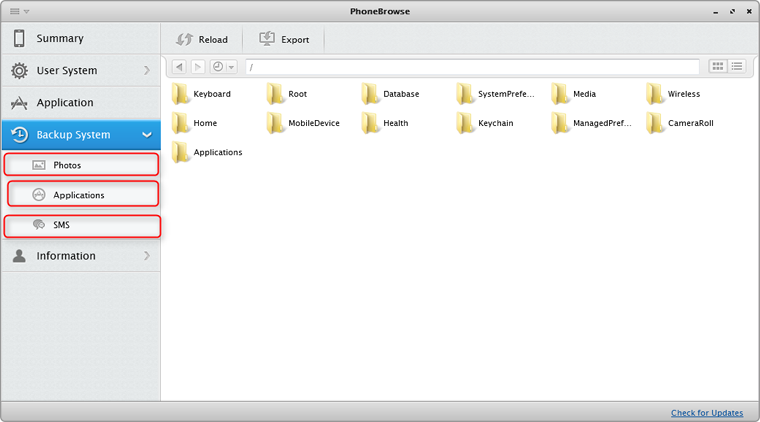 PhoneBrowse allows you to manage folders and files from your iOS through a screen that like the Windows Explorer. To keep the system simple and secure, users of iOS devices do not have direct access to the file system. As Apple locked down this shortcut toward freedom, here it comes PhoneBrowse, an iPhone Explorer software that may let you customize your app icons, extract photos / messages / notes and more from iTunes backup, or save all of your apps with game saves, without even having to jailbreak [Some features are only for iOS 8.3 or earlier version]. If you use an eBook reader, comic book or other video player app, syncing files through iTunes could be a nightmare since it's really slow and confusing. PhoneBrowse is designed to make adding documents, videos, ebooks, and other files to third-party apps as easy as 1-2-3. Moreover, you are now also empowered to manage all kinds of files by creating, renaming, deleting operations. PhoneBrowse is the only clean, safe and free iPhone browser software that gives you full control on iPhone, iPad and iPod touch file system. Via bringing about an intuitive File Explorer interface, now this thoroughly redesigned iPhone backup extractor helps you to instantly access and manipulate iOS file system with or without jailbreaking the device. Modify iOS File System - You can freely and breezily add, delete or rename all types of file saved on your iOS devices so as to get the most out of them. It's just your perfect iPhone Explorer freeware running on both Mac and Windows computer that allows you to use all models of iOS devices as USB flash drive, including the latest iPhone 7 (Plus), iPad Pro, iPad mini 4, iPod touch 6, etc. Explore iPhone Backup - You can recover iPhone iPad photos, notes, messages, contacts, voice memos, and even Safari bookmarks from an iPhone backup, but it never lets you select or preview the content inside. PhoneBrowse will give you a hand to load these device's backup data so that you can freely browse and manage all the files within. Keep iPhone Jailed - Designed as a no-jailbreaking-needed iPhone explorer application, PhoneBrowse supports drag-n-drop interface to manage your iPhone files. So everything you exploring with this free iPhone browser is the same as on Windows File Explorer. That's the way you should have to enjoy your own gadget. No matter you often or occasionally need to use iPhone, iPod touch or iPad as USB pen drive, PhoneBrowse exploits all of them to give you general-purpose storage space. 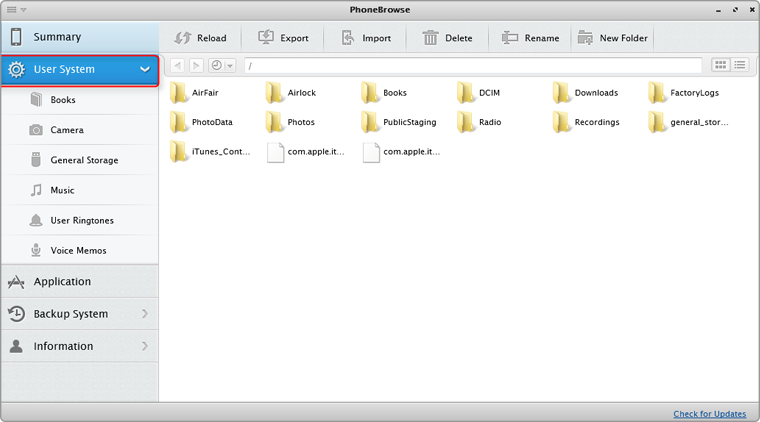 PhoneBrowse is an easy and free iPhone Explorer that you can rely on. Connect your iPhone, iPad or iPod touch to the Windows/Mac computer via a USB cable > If you have several iOS devices and would like to manage all of them at the same time, PhoneBrowse takes it easy to support unlimited devices. Click User System and you will enter into the management window. You can view all files located in User System, including Books, Camera, General Storage, Music, Ringtones, and Voice Memo. Or, you can export, import, delete and rename particular files or create a new folder. Open PhoneBrowse after connecting your device to computer > Click Backup System and choose one of the backup files > You will enter into the iPhone Backup system for further management > Choose photos, notes, messages, contacts, or bookmarks from an iPhone backup to extract. Need An Ultimate iPhone Manager? Consider Upgrading PhoneBrowse to All-new AnyTrans 5. You'll get impressive facility over iTunes and other similar iPhone Explorer. Check out all new and exciting AnyTrans features below. How to backup my iPhone to computer? In this post, we offer you two methods to backup iPhone to computer: with or without iTunes. How to transfer music from computer to iPod or iPod touch? Read this guide to put music on iPod with a few clicks. If you sync your iPhone (iPad or iPod) with iTunes, it saves the backups on computer. Read this post to learn how to delete iOS backup on Mac. How to access iPhone files like photos, videos, messages, notes on Mac? Read on to know a quick way to access iPhone files on Mac computer.